Pamela MacElree provides us with a lot of content on kettlebell training for kids. She mostly talks about kettlebells being a great tool for introducing strength training to athletes and learning movement mechanics. In her recent INSIDERS EXCLUSIVE post, Pamela spoke about how easy and simple it is to switch from one exercise to another, providing a great avenue for complexes and challenging all ranges of abilities and levels. Check out the complexes in Insiders today! Transitions are important – One kettlebell exercise should put you in a good position for the next kettlebell exercise in the complex. Athletes should be proficient in each exercise in the complex – You do not want to introduce new exercises in a complex. Be sure that the athlete is proficient in individual exercises prior to putting them back-to-back in a complex. Ability to recall exercises – Complexes should make sense to your athletes. You don’t want to compile a boat-load of exercises into one complex. They will spend most of the time trying to remember what is next, losing focus on the form and mechanics. Find the balance – Balance the number of exercises in the complex with the complexity of the exercises themselves. Keep it simple. Pamela has provided our Insiders with exclusive videos on two complexes. If you are currently an Insider, log in and check them out! If not, you can snag them for a month at only $1. Pamela has owned and operated her own fitness business in the Philadelphia area for the last decade. In addition to training clients, she has spent the past 4 years coaching other fitness professionals through FR Nation. Pamela has her Masters degree in Sports Performance and Injury Prevention, and also has expertise in kettlebell training, women’s fitness training, time management, goal setting and accountability. Pamela lives in Mt Airy, PA with her husband and their three furry, four-legged children: Bella, Leo & Max. With certain exercises for athletes, heavier isn’t always better. EEK! Did I really just write that for everyone to see? Coming from someone who constantly talks about picking up more weight, this might seem like a partial shock to you. The truth of it is that some kettlebell exercises are better served with lighter to moderate weight, especially while learning them. There are 4 really awesome kettlebell exercises for athletes that will help increase shoulder stabilization. The unique thing about these kettlebell exercises is that we’re working on shoulder stabilization while the body is moving through multiple planes of motion. I’ll go over two now and two in another blog post. Typically, we could put more weight overhead and stabilize it than we could actually press overhead. In the four kettlebell shoulder stabilization exercises I’m going to go over with you, you will likely find that you need to back off the weight and use something a little lighter than you might initially expect as I mentioned earlier. This is why we choose to do several shoulder stabilization exercises that are more complex than just overhead holds or walks. Let’s first take a look at the arm bar. Always start the arm bar by rolling onto your side. Once on your side, grip the handle of the kettlebell with both hands and hold it close to your chest. Next, roll onto your back and press it overhead. Once you are lying on your back with the kettlebell pressed overhead, raise the opposite side arm overhead on the floor and flex the hip and knee that are on the same side of the body as the kettlebell. Keep the knee above the hip and begin to rotate to the side that is opposite of the kettlebell. Keep your focus on the kettlebell. Once you have rotated enough to touch your knee to the ground, begin to straighten that leg and aim to get the front of the hips close to the floor. When you are stable, you can direct your nose toward the floor. You’ll notice in the arm bar that the shoulder must be very stable as the body moves around the tall pillar that is created by the arm. The kettlebell sits nicely in the hand as the weight sits closer to the shoulder than it would with a dumbbell. The next excellent shoulder stabilization exercise for athletes is the high windmill. Again, the shoulder is forced to stabilize as the body moves. This particular exercise is also great for strengthening the entire core. Starting with the kettlebell in the overhead position from standing, shift about 70-80% of your bodyweight onto the same side leg that has the kettlebell overhead. 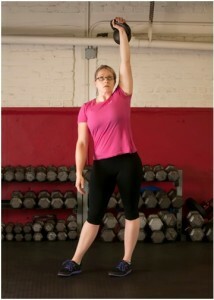 Maintain a vertical line with the arm that holds the kettlebell and the same side leg. While maintaining the weight shift, fold at the hips (similar to the feel of a good morning) and guide your free hand along the inseam of your leg. You can keep a soft bend in the other leg or keep it straight depending on your flexibility. In these 4 shoulder stabilization kettlebell exercises for athletes (remember, I’ll be sharing 2 more in a second post), the arm always maintains a vertical position to the floor above the shoulder, regardless of where the body is. It is important to keep the shoulder retracted and not elevated, or in layman’s terms, always keep the shoulder down and back. If at any point the arm starts to sway and you are unable to hold the weight of the kettlebell directly over the shoulder, you should decrease the weight you are working with. Think about the shoulder being the base or foundation and the arm being the structure. The arm must stay vertical and perpendicular to the floor. There should be no bend in the elbow or the wrist as you progress through these kettlebell exercises. Think of it like a leaning building: at some point, the foundation will start to give and the structure will begin to fall. Check back for the other two kettlebell exercises for athletes on increasing shoulder stabilization. Can’t wait and want to learn more about kettlebell training? Continuing education is one of my favorite things to spend money on. I know that there is a big return coming on the money spent on products that help me improve as a coach. So in truth, any information gleaned from a text or DVD is valuable for me, but if I had to rank them here is how it goes. This product really is what sets the IYCA apart. 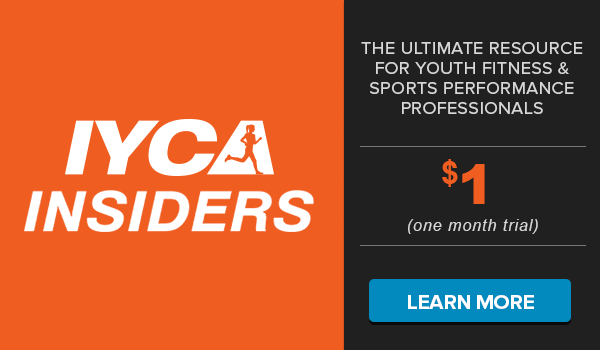 There is no more complete text about youth fitness and training athletes from ages 6-18. This text defined for me what youth athletes need when it comes to training. It underwent a recent update and has been improved even more from the original. This was the first product I was ever involved in creating and is the most practical text I have ever read about training high school athletes. There are dozens of done-for-you high school training programs. If they don’t fit the bill for your training situation, there is a huge text book giving you the tools to replace movements with ideal choices. The fact that it was written by Mike Robertson, Eric Cressey, and Toby Brooks makes it even better. Normal texts talk a lot about theory but this one really does tell you how to apply theory to make great high school athletes. Written by Dave Jack, Latif Thomas, and Toby Brooks there is not a better text about speed and agility available anywhere. It is required reading for all interns with me, and for all the coaches that work in my facility. The section on lateral speed alone is worth the investment. That being said I have never read a more practical de-construction of the mechanics of acceleration and high speed running than what is provided in this text. I grouped these together because there is always a weak point in coaches arsenal that needs to be improved. The IYCA has provided 3 manuals that can help you eliminate those points to become a better coach. There are no better kettlebell instructors than Jason C. Brown and Pamela MacElree at teaching kettlebells in an easy to process way. When it comes to resistance band training, no one surpasses Dave Schmitz in his knowledge, I have seen him train elite football teams with only resistance bands, creating some of the fastest and most explosive athletes I have been around. The Olympic Lifts course is designed by me, and in my honest evaluation, it is the only product that comes from someone with an elite Olympic lifting background that uses the lifts primarily to train young athletes and not competitive Olympic lifters. Each of these products can help make you a better coach in a chosen weak point. There are plenty of other awesome products from the IYCA. The Youth Fitness Specialist Level 2 and Level 3 products can only elevate your knowledge, and are the most thorough texts I have ever seen on a given subject matter. One of the most common questions I receive is “What’s the difference between and kettlebell and a dumbbell?” Quickly behind that question follows “Will kettlebell training carry-over into my activities of daily living more than training with dumbbells?” This is a hard topic to demonstrate via written word so I thought a short video would work best but I’ll give you quick low-down here as well. There is a distinct mechanical difference between a kettlebell and a dumbbell and it’s based on law of levers.